From 38Pitches, Curt Schilling would like to know: why wasn’t Kyle Farnsworth ejected for throwing at Manny Ramirez last night? From Deuce of Davenport, why does Marty Brennaman hate Cubs fans so much? From Slate, why are today’s ballplayers more likely to be born in August, and why are tomorrow’s stars more likely to be born in May? 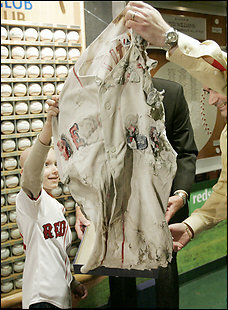 From PhilSox Blog, why could that whole buried-Sox-jersey-in-the-Bronx thing have been an elaborate hoax? From Fire Joe Morgan, why are “gamers” always white? From Home Run Derby, why can Carlos Pena only hit home runs? From Beantown West, why is Torii Hunter annoyed that white players wore #42? From Cobra Brigade, why do the Cubs always get such freak injuries? And speaking of freak injuries, Sports by Brooks would like to know: why the heck is Joel Zumaya doing keg stands? And of course, UmpBumpers, we’re always looking for good reading here at UmpBump. Have you read something neat lately? Let me know!